Note from Design Mom: I met the talented Gina Wide on my trip to Sweden. She’s an American mother raising her kids in Scandinavia — while they attend French schools! About a year ago we hatched a plan to create a parent & child project series. And today’s the day we get to share it. Hooray! Images and text by Gina Wide for Design Mom. Edited by Amy Christie. I’m Gina Wide and it is such a thrill to meet you here at Design Mom with a new series: Big & Small — Side-by-Side Projects for You & Your Little Ones. The big variation is something that will appeal to you, and the small variation is a simplified version of the same project, just right for young children. First up: Ice hangings! 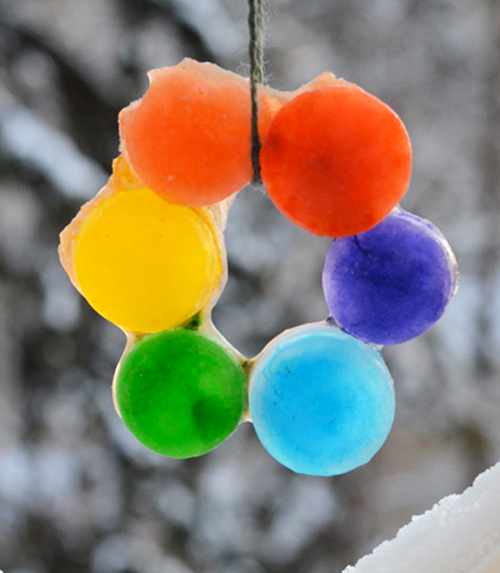 They’re a delightful way to add rainbows to winter skies, welcome cold-weather visitors, or decorate for a party. Don’t you think they could chase away the most gray of days? 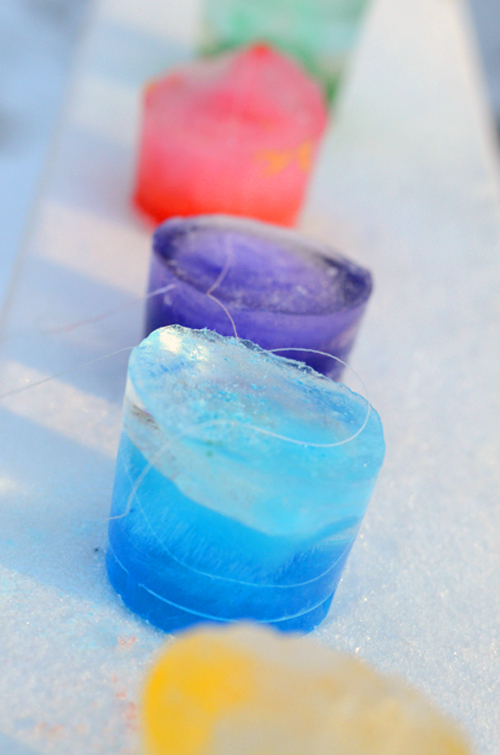 The “freezing” step of this project makes it feel almost magical for children — once these have been un-molded and displayed, you won’t believe how quickly your little ones will say: “again!” The best part: You probably have all the supplies you need for this project right at home! First up, a Big Ice Ring. 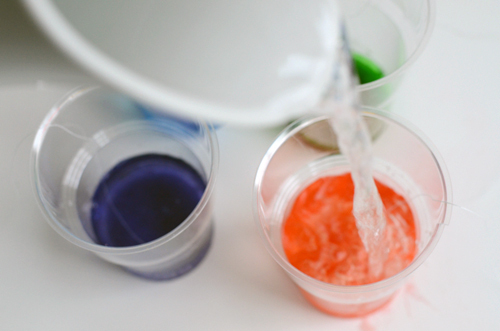 Color the water and the fill the cups with about 1/2 -3/4 inch with colored water. Prepare a working space on the counter and remove the disks from the freezer. Working as quickly as possible, remove each disk by cupping the plastic cup in your hand to heat the ice surface. Carefully, turn the cup over and remove the ice from the cup. After the ice disks have been removed, place them, one by one in a circle, in the middle of the cake pan. It is important that the disks are touching one another. 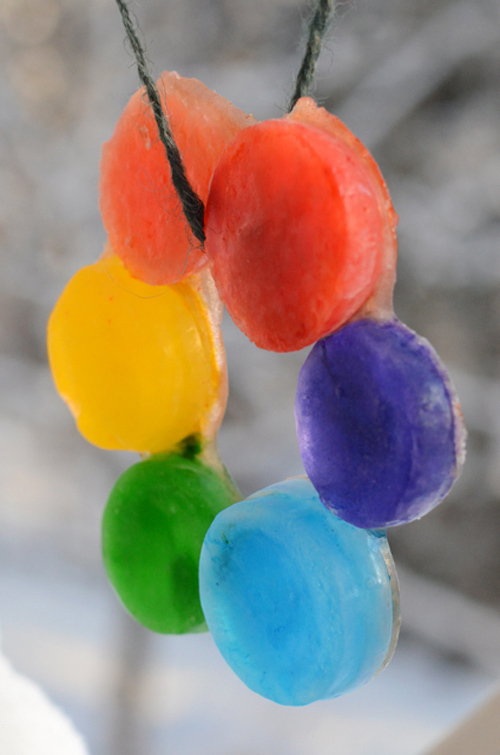 Once you’ve created a ring with the colored ice disks, pour a small, small amount of water over the ring. The depth of the water will be about 1/8 of an inch. This step ensures that the disks freeze together. Work as quickly as possible, making sure to keep the ice disks touching. Return the cake pan with the disks to the freezer. Freeze until completely solid. Don’t worry if the water discolors. This excess will be chipped away later. Once frozen, remove the cake pan from the freezer and carefully, carefully chip away the excess ice leaving only the colored ice disks in place in the shape of a ring. Cut your desired length of cord. 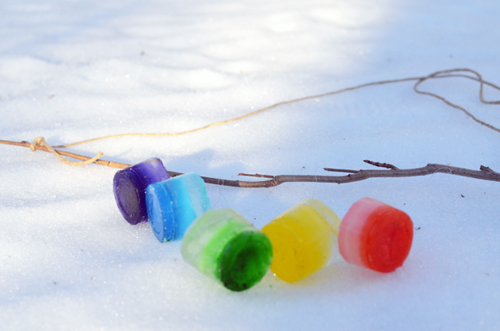 Thread the cord through the middle of the ice ring and hang to enjoy your rainbow of color. Now for Small Ice Hangings. This adaptable small hands project is wonderful for small ones who want to work alongside the grownups. 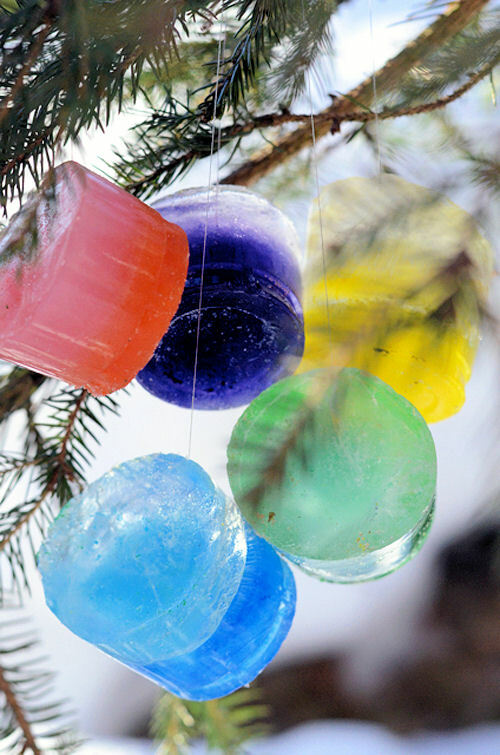 These beautiful ice hangings are created with very little effort and can be hung individually or strung in a rainbow on a stick. 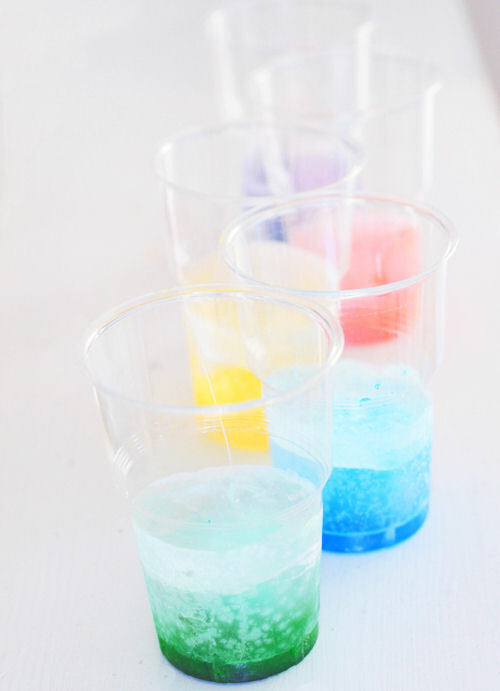 Fill cups as high as desired with colored water. Cut a length of thread or cord and place one end of the cord into the water and immerse. This needs to be as deep as possible in the water. 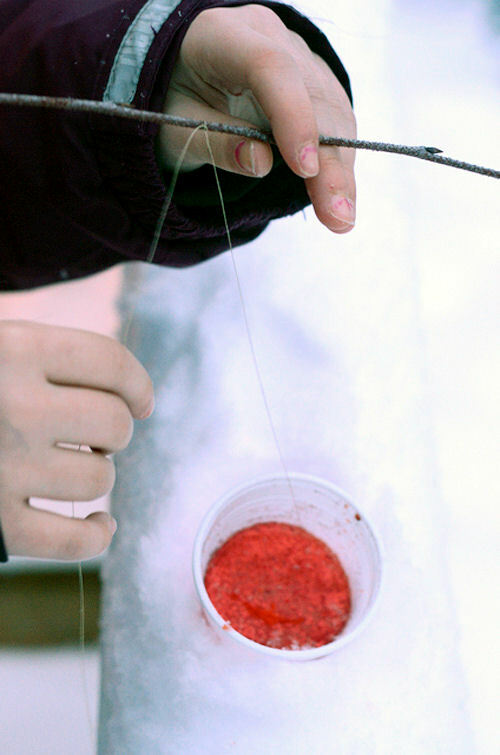 Freeze cups, paying attention to keep part of the string immersed while part stays above the water. Prepare counter space or just gather the cups and go straight outside. Find yourself a nice branch to hang the ice. Use your hands again to help heat and release the colored ice from the cup. Then loop and hang on a branch. Either individually or in a group, these are beautiful hanging outside! I hope you get a chance to try this Big & Small project right away — maybe even this weekend, or during your winter break. If you give it a try, I’d love to hear how it goes for you! I’d also love some feedback on the series in general. Do you enjoy working on projects with your kids? Does this series appeal to you? Do you get more excited about projects that are strictly beautiful? Or projects that have a learning or science-based idea behind them? So glad to see this. Gina is great! This looks wonderful! A reason to be grateful for cold weather. I am going to do this with my girls ASAP. not a florida project, either! The “small” projects are also good for “craft-incompetent” like me! A nice way for me to do a project with my kids. I don’t really do projects with my 2 year old but I am trying to collect ideas for things that I am capable of executing. :) Thanks! Yes please! LOVE the simplicity of this! These will make great colorful building blocks for outside play. I would love to see more kid craft ideas!!! What a fantastic idea and series! More please! I follow Gina on Willowday so I am so pleased with the collaboration with Design mom. I love both sites. That is so creative! Not to mention fun to make! Gabrielle, I am thrilled to join you and your creative site!! Happy Weekend! So great! I want to make these ASAP but have a question. 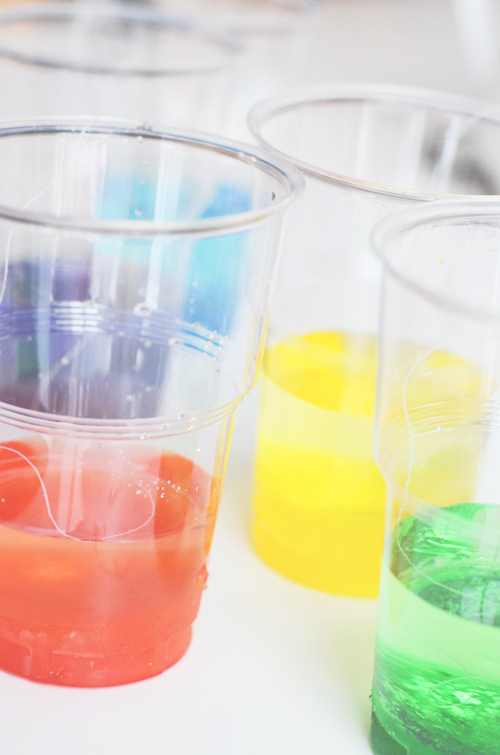 Do you think the food coloring will stain whatever it drips on to when it melts? Would you avoid hanging it over stonework, patio furniture, etc? Thank you! To be safe, I would avoid hanging these over any sensitive materials. I have tried this twice now. The ice ornaments are easy but the ice wreath keeps giving me problems! Each time I’ve tried to chip away at the exces ice it always cracks and breaks apart the wreath ring. Totally bummed out! Thank you for sharing and I’d so much like to help you so that you can enjoy both! I’ve never experienced this when making the ice wreaths however, I have had a similar problem with a new ice project we’ve made this past week and I wonder if it might be an idea to use the technique I used for that: simply carefully spoon drops of your hottest tap water over the center to melt away any of this excess ice, bit by bit — emptying it quickly between each addition and moving the final wreath promptly to the freeze or icy outdoors. Happy Making! This is so clever and beautiful. I never thought of putting string directly in the ice for freezing. So smart! This is a super neat idea! 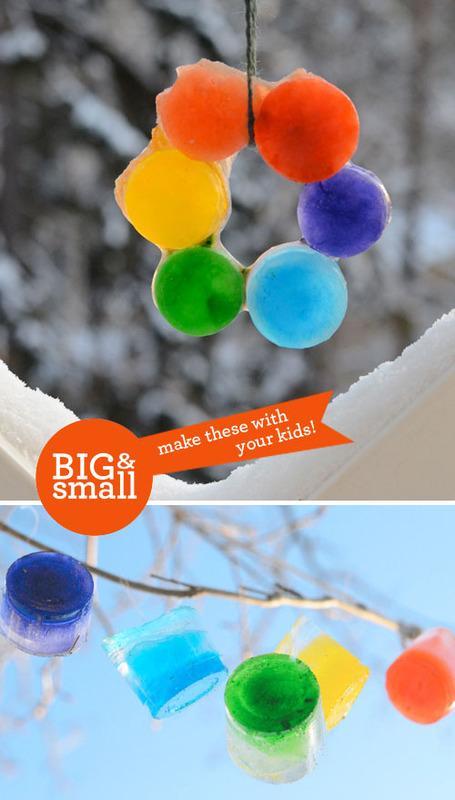 Freezing a water balloon with string in it would make a neat shape to hang also. Lovely DIY creation. It’s colorful end pretty. Thanks for the tutorial. I like this post very much !! Really Appreciated. This is so smart and lovely. I never thought of putting string straightforwardly in the ice for solidifying. So keen!